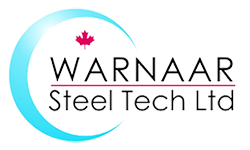 Warnaar Steel-Tech is Steel Structure certified with the CISC, maintains a CSA Standard W47.1 certification with CWB, and is an active member of the CISC promoting Structural Steel use in the construction industry. We undergo regular CWB inspections and audits by Quasar for the CISC to ensure we continue to deliver on the quality of supplied structural steel products we deliver to our clients. The Steel Structure certification is based on ISO 9001 criteria and was designed to make it easy to transition to an ISO qualification if needed. As a result, we consistently deliver a quality structural steel product by maintaining an internal system of checks that prevent errors while fabricating. This ensures an accurate fit of our structural steel in the field with quick and efficient installation times and minimal field rework required. A copy of our current certificates are available to clients upon request.